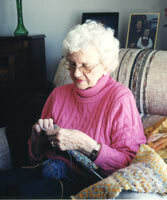 Dorothy,whose 25 years of inspirational knitting have kept us going. In memory and grateful thanks to Helen, whose fabulous talents and humor influenced us all. Joan, using her Acadian spinning wheel to twist spring fleece into yarn in Sedgwick. Joan, spinning hand-dyed roving into yarn. Joan, close-up of her spinning the spring fleece. Meriam in Nome/Seward Peninsula, Alaska, with a a gathered pack of fallen caribou antlers. Meriam in Homer, Alaska carving fossil walrus tusk buttons.